I posted previously some thoughts about the 13 players drafted out of New England (Massachusetts and New Hampshire), so I thought I would cover the five prospects taken from the Empire State in the 2015 NHL Entry Draft. The numbers tell the story- with just five area natives taken out of the 211 total selections and none before pick 50 when the Minnesota Wild chose power winger Jordan Greenway who grew up near Potsdam in Canton, N.Y. before leaving in middle school to play for Shattuck St. Mary’s in the state of the NHL club that drafted him. Overall, it was a down year for New York with no players from New Jersey getting the call, a first since New York Hockey Journal covered its first NHL draft in 2011. The player I actually had rated higher than Greenway is playmaking forward Jeremy Bracco, whom the Toronto Maple Leafs got terrific value with at 61st overall- the last pick of the second round. Bracco had solid first-round talent, but working against him was size, a lack of dynamic speed and according to some NHL scouts, he didn’t make the best impression during interviews. 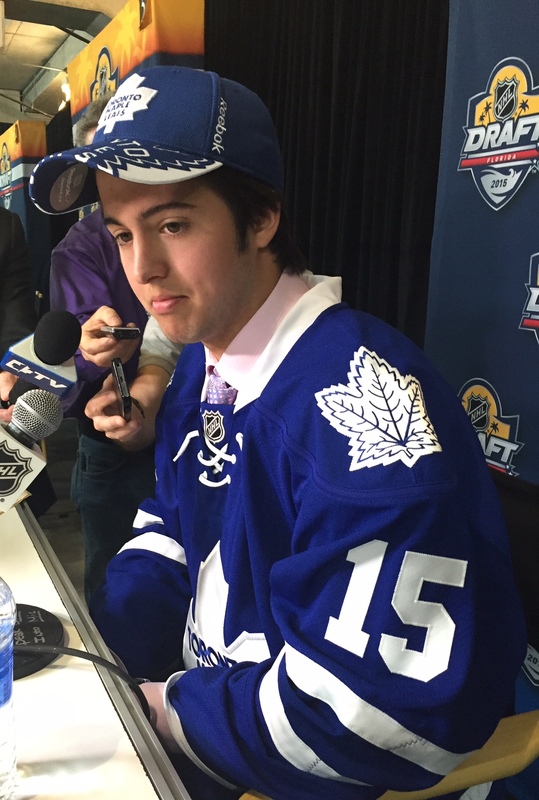 From my perspective, I didn’t see that– Bracco was extremely accommodating in terms of the pre-draft interviews and work I did with him. What is undeniable is his high-end hockey IQ, vision and creativity- he finished his career at the U.S. National Team Development Program as one of the all-time assists and points leaders in two years there. Bracco is a good fit for Toronto and what they’re doing there as someone who can dish the puck and has the kind of flair in his game and personality to be able to handle the increased scrutiny of that hockey market. Getting back to Greenway- one NHL scout told me that he was easily a top-15 talent, and I have to say that having covered a lot of hockey players in my career, there aren’t many with the sheer size the 18-year-old has at a listed 6-foot-5, 230 pounds. Some kids look big in their gear but smaller when they take it off, others look bigger out of their gear than with it on. In Greenway’s case- he looked massive on the ice, and he’s just as much of a force of nature when dressed in his suit and wearing his Wild jersey at the BB & T Center. Two things more than any probably conspired to make Greenway’s wait a little longer at the draft: he did not have the kind of consistent performance over the course of 2014-15 that was expected of him after showing a lot from a year ago with the NTDP. When a player brings so much in terms of the size and skating package, you naturally want to see him assert himself and at the very least, generate offense commensurate with his skill level. It just didn’t happen enough for him this year, and that hurt his stock a bit going in. Compare that to the kind of offensive season fellow Wild first pick (and fellow New Yorker) Alex Tuch had a year ago and you begin to understand the disparity. In addition to the disappointing season, there were whispers about Greenway’s conduct off the ice. In fairness to the kid- I’m not going to repeat or substantiate any of those allegations from NHL circles, but it does at least begin to explain how someone with such pure potential dropped down to 50. At Boston University, Greenway will have a chance to learn from the experience and elevate his game in order to make all the teams that passed on him regret doing so. The reigning Stanley Cup champs grabbed two-way defenseman Dennis Gilbert from Buffalo at the end of the third round, another solid value and typical pick of the NHL’s modern dynasty that has endured as a three-time champion in six seasons because of a great core and smart drafting to keep a solid supporting cast in place even when pricey contracts force pieces to find work elsewhere. Gilbert may be the latest in one of those smart picks by the Blackhawks, as he has a solid, tall frame (6-2, 201); he can skate very well for his size and has the vision and puck skills to move the play forward with authority and quarterback his club when on the man advantage. Although raw, Gilbert showed a lot playing in the Windy City’s USHL entry the Chicago Steel this past season, having a particularly strong second half. He’ll be able to develop gradually in the ‘Hawks’ system, starting at Notre Dame in the fall. Another Western New York kid who had his name called last month was big defender Joseph Cecconi, who made a positive impression with the USHL’s Muskegon Lumberjacks. At 6-2, 205 he has size and is a pretty good skater in a straight line, though will need to improve his lateral mobility and pivots/transitions as he continues to develop. Cecconi relishes playing a defense-first style and impressed some people in the playoffs last spring when he battled Kyle Connor hard and effectively neutralized the league’s top scorer and Winnipeg’s top pick. As a fifth-round selection (133rd) of the Dallas Stars, Cecconi is a good value and the University of Michigan-bound player is in a good spot to take his time. He’s been knocked for not playing with enough urgency/pace at times. Finally, Steve Ruggiero was the area’s last pick, coming late in the sixth round. He had a bunch of family and friends in attendance and I happened to be taking a break from the action nearby in the stands eating a box lunch when his name was called and their section erupted. To me, Ruggiero’s selection underscores what this sport is all about. These kids- and so few of them at this stage are left to seriously pursue a dream of playing pro hockey- put in so much work over the years to even get themselves in position to be drafted. Their families pay enormous costs to support the hockey lifestyle and give up a normal life (along with their player) to have a chance at one day reaching the NHL, so it was nice to see Ruggiero’s faith that by coming to Florida he would not sit there all day only to be passed over. 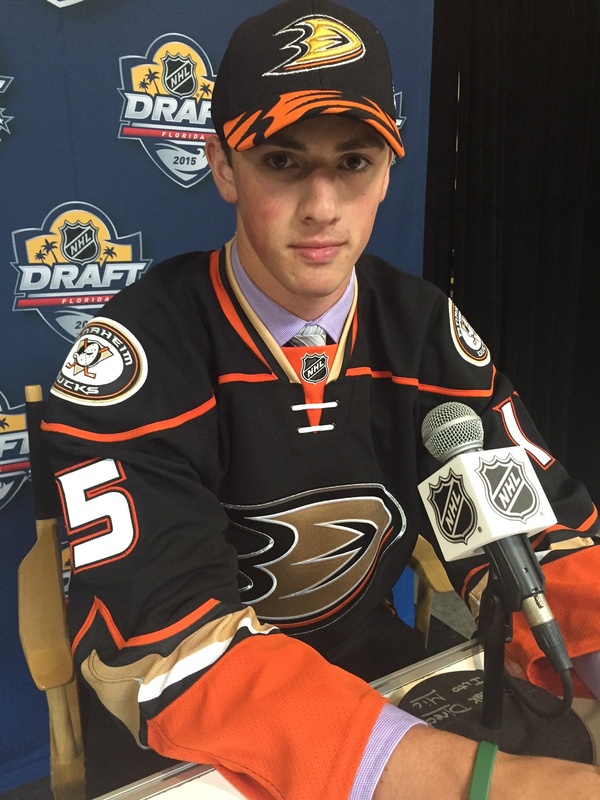 A rugged, mobile stay-at-home defenseman with character, the Anaheim Ducks got more solid value at 178 overall, and he looks to be another one of those good character types that Nate Leaman and his staff have done so well to stockpile down at Providence College. All in all- not a great draft haul for New York, but there might be a rebound next season when talented defensemen Charlie McAvoy, Griffin Luce (son of Florida Panthers head of player development Scott Luce) and forward Luke Kirwan are eligible. Kirwan took a step back in the OHL this past season, but the toolsy winger could appeal to teams early if he can get back on track in 2016.